Pharmacists are healthcare professionals who are experts in medicine. Too readily, they are dismissed by the public as that person in a white lab coat who stands behind a counter and hands out prescription medicine in white paper bags. But pharmacy is a rich and varied occupation that is expanding within both healthcare and industry. Pharmacists represent the third largest healthcare profession in the UK behind doctors and nurses. Furthermore, the pharmacist is often the first healthcare professional that the public will have contact with whilst seeking treatment. So the pharmacist’s role in the provision of healthcare in the UK is vital. It is significantly more than just handing out drugs. The shift in the allocation of responsibilities away from GPs also means that the pharmacist’s role in front-line healthcare is growing. Combine this with the research and development of new drugs and delivery methods and constantly changing regulations and government guidelines, pharmacy is a dynamic and exciting world. Pharmacy is the management and dispensing of medicines in adherence to a doctor’s prescription. The majority of pharmacists work in high street pharmacies as community pharmacists. As well as prepare and dispense medicines, pharmacists offer advice to the public over treatment options for their conditions. Pharmacists also ensure that strict guidelines regarding the secure storage and disposal of medicines are adhered to. Providing training to more junior pharmacy workers is also an important aspect of being a pharmacist. What sort of people become pharmacists? Calm and professional attitude Above all, pharmacists like people and want to make a difference to their communities. There are several reasons how pharmacy differs from pharmacology. Pharmacy is an occupation that deals with the management and dispensing of medicine. Pharmacology is the study of drugs and their effect on biological systems. Pharmacists are healthcare professionals whereas pharmacologists typically work in industry developing new drugs and cannot legally practice pharmacy. Pharmacists, however, will have studied pharmacology and can progress into research and development roles. Satisfy the GPhC fitness to practise requirements for registration as a pharmacist. All those practising pharmacy in the UK will have completed the above. The route onto the MPharm course may differ, nevertheless, without the MPharm qualification you cannot become a pharmacist. The Masters degree in pharmacy (MPharm) is a General Pharmaceutical Council (GPhC)-accredited qualification that is mandatory for all pharmacists. It is a full-time, four-year course. Some universities offer a five-year sandwich degree course that includes the one-year pre-registration training. The entry requirements for the MPharm differ from university to university. Typically, they are A-B grade A-levels (or equivalent) in chemistry plus either biology, physics and mathematics. Some universities will accept A-B grade A-levels in chemistry and biology and one other non-science subject. The MPharm course is comprehensive. Alongside the chemistry and biology behind medicines, you will study communication, public health and the professional practice of pharmacy. You will also become practised at making the calculations necessary for preparing doses. The course is delivered via lectures, coursework, practicals and work experience. An alternative route into pharmacy is the Pharmacy Foundation Degree. This two-year course includes the first year of the MPharm degree in addition to work experience in a pharmacy environment. From the foundation degree, you can be accepted onto the MPharm starting with the second year. Other universities offer an integrated MPharm and Foundation course. The Pharmacy Foundation Degree is also a great choice for those without the prerequisite A-levels (or equivalent) for the MPharm. The foundation year is there to equip students with the knowledge needed to progress onto the MPharm. If your course does not include the one-year pre-registration, you will need to find a vacancy within an approved pharmacy setting. Generally, students apply for work placements before their final exams. Pre-registration is usually 12 months in a community or hospital pharmacy. However, split registration placements are possible which mix experience between two settings including hospitals, GP surgeries, pharmaceutical companies and academia. These types of placements a much fewer in number and so may have specific entry requirements. You may be able to secure a placement via contacts you made during any work experience that was included in your degree. Otherwise, there are many resources available to find a suitable vacancy. The organisations listed at the end of this article will provide advice and/or pre-registration training vacancies. You will be assigned a more senior pharmacist who will be your pre-registration tutor. Pre-registration training involves regular assessments and reports so you will need to pass this training before you can progress. The GPhC exam consists of two parts and is designed to assess all aspects of pharmacy. The exams are held at assessment centres and both parts will be assessed on the same day. Part one is calculation questions and part two is a ‘selected response’ format covering all aspects of pharmacy including calculations. You must pass both papers. The pass mark for the exam varies and is specific to each paper. The difficulty of each exam is assessed by a large body of pharmacists in academia. From their assessment, the pass mark is derived. The results of each assessment will be published on the GPhC’s website and written confirmation sent out to all examinees. Once you have passed the exam you can apply to the GPhC to register as a pharmacist. The GPhC will confirm that all criteria have been met and you will be added to the register. Registration involves a fee and you cannot apply for a job as a pharmacist until you are on the register. Unemployment rates among qualified pharmacists are low as most graduates will get jobs in high street pharmacies or in NHS hospitals. For example, within six months of registration, around 88% of graduates are in a graduate-level job with 7% continuing their education (source: survey conducted by Hesa in 2015-16). The vast majority of pharmacists work in community or hospital pharmacies. Whereas between 2-4% work as industrial pharmacists for pharmaceutical companies. Pharmacists can also work as locums - a freelance/self-employed pharmacist. Locums offer temporary cover to pharmacies such as during times of high demand for services or to cover holiday and sickness of existing staff. Locums have self-autonomy over their pay, where they work and when they work. It can also be a great way to accelerate your experience through exposure to multiple work environments. Community pharmacists work in independent or large retail chain pharmacists on our high streets. They deal directly with the public when fulfilling doctor’s prescriptions and advise on minor ailments. They may also offer additional services such as vaccinations, blood pressure and cholesterol monitoring plus quit-smoking clinics. There are good opportunities for career progression into managerial roles for community pharmacists. Branch and regional manager roles and head-office roles including business development and staff training are all possibilities. You can also expand your pharmacy skills by taking a prescribing pharmacist qualification. See the Continuing your pharmacy education section below. Hours Most community pharmacists work retail hours which includes some evening and weekend work using a rota system. Salary Starting salaries following registration is typically £30,000 to £35,000. This can rise to salaries of £45,000 to £70,000 for managerial or other specialist roles. Duties for a pharmacist working in a hospital are similar to a community pharmacist in regards to dispensing medicine. However, a hospital pharmacist’s role can expand to include consulting on choices of medication and treatment plans. A hospital pharmacist works directly with doctors and nurses and therefore may be included in ward rounds. Hospital pharmacists can also work within Urgent and Emergency care units. There is much more opportunity for clinical pharmacy within a hospital than in a community pharmacy. Observing and monitoring first-hand the effects of medication on patients, for example. There are also opportunities for running clinical trials for new medicines and administration techniques. Some hospitals also have drug manufacturing facilities that a pharmacist may be involved with. This results in the hospital pharmacist gaining an insight into industrial pharmaceuticals as well. When working for the NHS, you will follow a set career path with good opportunities for personal and professional growth. Training may include clinical and managerial qualifications but also being kept up to date with new drugs and procedures. The most senior pharmaceutical and consultancy roles within the NHS are significantly fewer in number, however. Hours Working in an NHS hospital, pharmacists will work 37.5 hours per week including evenings and weekends. Being part of an on-call work is also likely. Salary A starting salary for a hospital pharmacist working for the NHS is between £26,000 and £35,000. Similar roles within privately run hospitals will differ, however. The most senior pharmaceutical roles within the NHS earn between £80,000 and £100,000 per annum. Potential to have a greater impact on treatment effectiveness and therefore hospital efficiency. I always knew that I wanted to be a pharmacist, having grown up with both a father and uncle in the profession. From high school, I gained a place at London School of Pharmacy (UCL) and finished my masters there. During this time, I worked with my uncle in his independent pharmacy as a pharmacy assistant during evenings and occasional weekends. After university, i found it difficult to find full-time work, and so decided to try picking up one-off shifts as a locum. This allowed me to get a lot of experience in other independent pharmacies and pharmacy chains, in the Greater London area. However, London locum work is extremely competitive and I knew I wanted a full-time career, and so continued to apply for permanent positions. A few months into my locum career, I attended an interview for a full-time pharmacist post in Caldecot Centre pharmacy and started work there a month after that. Hospital pharmacy work is quite different from community pharmacy work I am more used to, but it has been a fascinating change for me and I really enjoy the clinical side. Your scientific and professional development doesn't stop when you qualify as a pharmacist. Pharmacy is a constantly evolving discipline of best practice, new drugs and new delivery methods. The GPhC requires you to prove you are keeping up-to-date by undertaking regular continuing professional development (CPD). This is necessary to remain as a registered and practising pharmacist. The pharmacist independent prescriber qualification is a six-month course run by accredited universities across the UK. It allows a qualified pharmacist to prescribe medications within their clinical competence. The course is typically part-time because this allows for pharmacists study whilst working. The course is delivered by a combination of face-to-face classes and self-study. 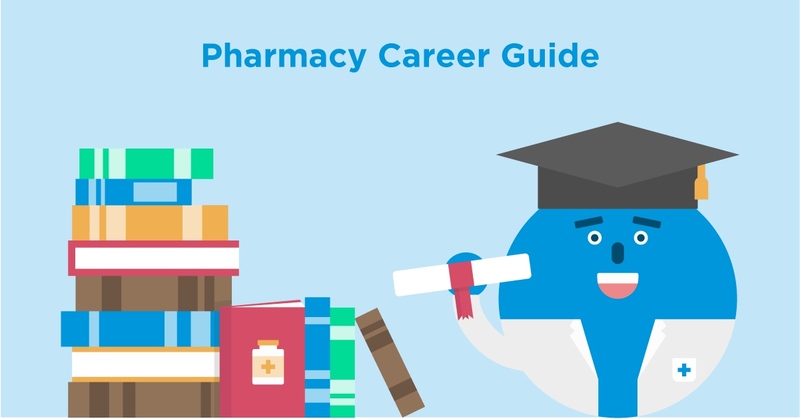 Becoming a prescribing pharmacist can allow for increases in salary and career opportunities. The purpose of this course is to improve and develop pharmacy practice skills and knowledge. It includes clinical pharmacy and therapeutic management plus professional skills. It is aimed at hospital pharmacists wishing to progress in their careers but any pharmacist may take this course. The Qualified Person is a quality assurance role in pharmaceutical manufacturing. They have the legal responsibility to ensure the quality and therefore the safety of medicines before they are released for clinical trials or into the market. In order to become a QP, you need to hold the Qualified Persons (QP) qualification. What else can I do with my MPharm? Pharmacists working in industry help develop and manufacture new drugs. They work in multidisciplinary project teams with other scientists such as chemists and statisticians. Their job is to select the best chemical candidates that have good drug characteristics such as absorption, efficacy and ease of manufacture. Regulatory affairs - ensuring that all pharmaceutical work, including clinical trials, is carried out in accordance with the applicable national and international regulation. There are always career opportunities within large organisations such as pharmaceutical companies. Business development, sales and marketing as well as training roles may also be of interest to an industrial pharmacist. See also Qualified Persons (QP) in the Pharmacist professional development section of this article. An emerging role within the NHS is the Primary Care Pharmacist. The NHS is investing heavily in primary care which seeks to prevent people from becoming ill as well as encouraging healthier lifestyles. Primary care pharmacists work in local communities supporting other healthcare professionals including GPs and community pharmacists. As a strategic role, the aim is to maximise the benefits of medicines whilst minimising the risks. They ensure the best possible allocation of medicines tailored to the needs of the local community. Primary care pharmacists also develop new treatment pathways and conduct research. Pharmacists within academic roles split their time between research and another aspect of pharmacy. Grants are available so pharmacists can apply for financial support for their research. Clinical academics combine working in a community or hospital pharmacy role with research. So the research needs to be compatible with their main role and have a direct impact on patient care. Academic pharmacists educate and assess the next generation of pharmacy students. Through their expertise, they shape and update the degree programme with the latest best practises and drug developments. They also conduct research and still practise pharmacy in a traditional setting. Academic roles offer great variety for a pharmacist. They satisfy both the scientific aspects of pharmacy and the pharmacist’s desire to help people. Regulatory Affairs is concerned with the many, and usually complex, drug-related regulations issued by governments and international bodies. These regulations cover all aspects of the manufacture and distribution of medicines and can differ from country to country. Regulatory Affairs ensures the granting of the correct licensing for the sale of medicines for each world region. Expected salaries for those working in regulatory affairs are on par with pharmacists working in communities or hospitals. However, there is potential to earn more with significant experience due to the potential to reduce the time to market for drugs. Scientific and medical writing is concerned with written communication such as publishing new research or drug protocols. The writer may produce articles for publication on new developments and findings, drug protocols that accompany packaged drugs, information for medical professionals or patients plus documentation for sales and marketing teams. Without a doubt, the pharmacist can use their exceptional communication skills to excel as a scientific or medical writer. GP Practices - similar to a hospital pharmacist’s role with more clinical application and direct impact on patient care. Care homes - working in a care home you will oversee medicine administration, resolve medicinal issues and train staff. Military - military pharmacists can be both civilian and service personnel. Veterinary - whilst the biological systems are different, there is opportunity working alongside veterinary surgeons in the development and delivery of medicines to animals. Pharmaceutical sciences are university courses that include aspects of pharmacy and pharmacology. They equip graduates to work in pharmaceutical industry or as a pharmacy technician. This isn't a pathway for becoming a pharmacist! Vocational qualification for people wanting to work as a pharmacy technician in a community or hospital pharmacy.